The digital age brings a familiar sense of tangibility to digital possessions. Binding an in-game item to a blockchain-based token transfers the ownership to the player, completely changing the perception of digital items. Why use blockchain in games? Acquiring a digital item becomes an investment that a player can trade or sell for profit. Tokenised items can be traded securely, without risk of fraud or theft by middlemen. Professional gamers can effectively monetize their talent by trading the digital items they earn by progressing through a game. Tokens can drive new functionality and gaming models, including one-off prizes as prestigious and unique rewards. Waves is an open source blockchain protocol. Our strategy is to provide features required to develop better games and make Waves available in all the popular tools. We make no vendor-locks and it’s up to you and your users to decide what tools fit you better. Latest update introduced Non-Fungible Tokens, similar to Etherium smart contract format ERC721, that allows you to make each token unique and track its history. Blockchain shouldn’t be complex, we would make integration as easy as it can be. Still got questions? Send us a message on dedicated forum section! Provide a marketplace branded by your product to make the user experience smooth. Your marketplace – your rules: assign your own transaction fee and monetize even better! Some games require a player to sign a lot of transactions. To make this process smoother we introduce safe one-click approval tools both on mobile & browser. 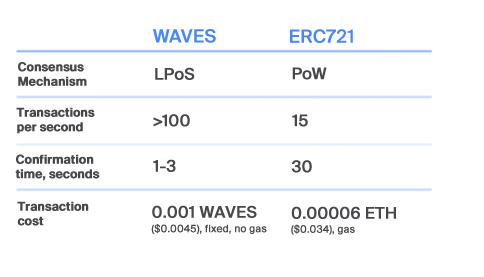 Waves is the only blockchain where a token is NOT a smart contract, but an ASSET. That allows us to process times more main net transactions than our competitors, get transactions into the block faster and provide the cheapest possible cost of a transaction. And now what’s the best part of it? You don’t have to make smart-contract code and there’s absolutely no GAS . really excited to see the gaming aspect of waves take off.